Microsoft Exchange 2016 is the world’s leading solution for hosted email, allowing your customers to collaborate, manage and communicate securely, efficiently and effectively. Because it’s hosted in the cloud, your customers can benefit from hassle-free security and reliability, with guaranteed 99.9% uptime. Exchange lets your customers tailor their email solution to their needs, and offers features including data loss prevention, Office 365 Groups for seamless collaboration, and apps for every device. Exchange can be ordered on its own, or as part of Office 365, a valuable package of essential business apps. Migration from other mail services is also possible. Office 365 Groups let you connect people, information and tools, helping your teams stay organized and productive. Get more done with a smart inbox that lets you focus on the most important messages. Manage your organization and tools from the easy-to-use admin centre. What’s new in Exchange 2016? Microsoft Exchange 2016 introduces several changes and improvements to the Exchange product. 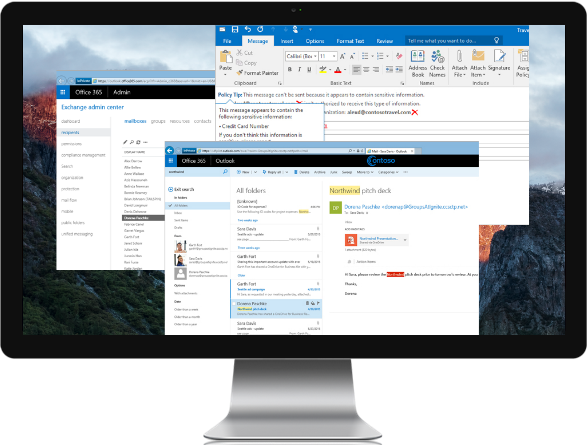 The new Outlook on the Web (formerly Outlook Web App) offers many new features ranging from a wide choice of themes, an optimized email reading pane, the ability to import LinkedIn contacts, and improved search options. It is compatible with Microsoft Edge, Internet Explorer 11 and the latest versions of the Mozilla Firefox, Google Chrome and Safari browsers. Users can link to documents stored in OneDrive for Business or on-premises Sharepoint instead of attaching a file, and view and edit these files alongside their emails within the client. Default protocol MAPI over HTTP offers better reliability and stability at the transport layer, and the ability to pause and resume the Outlook connection in order to change networks. Two-factor authentication can be enabled for stronger security. Improved data loss prevention (DLP) to protect 80 different types of sensitive information.